Ah, this Simenon novel is not familiar to me… and, as you say, more relevant than ever, darnit! I’m pretty certain it’s been translated before, as Chez Krull — I’ve come across reference to this effect while looking around just now for the title under which I think I read this book quite a few years ago. (I don’t remember it as Chez Krull either!) I’ve seen a screen adaptation of it, too, but again can’t remember the details: I’d remembered it as part of the Bruno Cremer French TV series (with Maigret grafted on, the way the various Christie TV series sometimes graft Poirot or Marple onto a standalone tale), but that seems, to judge by a quick perusal of IMDB, not to have been the case. Perhaps it was Le mouchoir de Joseph (1995), which French Wikipedia lists as an adaptation . . . Sorry! This comment is full of possiblies! Thanks for a great review, which has me thinking I should dig the book out again for a reread — as you say, it’s very short (like many of Simenon’s novels), so a reread might represent a few hours well spent. Oh, you’re very welcome. And thanks for the background on its history, translations and adaptations, uncertainties and all! An earlier translation would certainly make sense as it seems too compelling a novel to have been overlooked for so long. I can imagine it transferring to the screen very effectively too, a very ‘visual’ story in many respects – the sort of doom-laden narrative Clouzot would have relished back in the day. I think it would definitely stand up to a re-read in the current times. Wonderful review Jacqui, this makes me think, as an immigrant to France myself, about the encouragement of the authorities towards immigrants to change their surnames (and often first names), part of their policy of assimilation, because it is indeed a fact that a foreigner of any nationality, will encounter discrimination. There are very proactive laws on it and initiatives to counter it, which I have received the benefit of, although despite knowing there would be discrimination, I chose not to change my name, perhaps naively, but tolerance won’t come from suppression of one’s identity, but from friendships and through those willing to see the person. Fortunately those people do exist in the same communities. Thanks, Claire. I think that’s a really interesting and important point. In the novel, the Schoofs (the father also originally from Germany) have become naturalised, integrating into the local French community in a completely different way to the Krulls. The fact that the locals consider ‘Schoof’ to be Dutch name seems to have played a large part in this. Also, the Schoofs have learned the local language and always speak French in their own cheese shop, never German which would be considered too inflammatory – a point accentuated when Hans goes around town speaking German all the time. Excellent review, Jacqui. Simenon seems to have a much wider range than many readers are aware thanks to Maigret, at least in this country. Thanks, Susan. This is much darker than his Maigret novels, more in the style of his ‘hard’, psychological novels or roman durs. I know you wouldn’t normally pick up a Simenon, but if you were ever inclined to consider him, this is the one I would recommend. The focus on societal issues and prejudices against immigrants makes it a very thought-provoking read. This sounds like a case study in how outsiders can be vilified. It is indeed relevant to the world today. This is true for Europe and beyond. In addition, the book sounds very good. The plot and characters sound compelling. This sounds an essential read, and the economical style is very appealing. It’s a tragedy that this hasn’t dated at all – will we never learn? I know; it’s a question I ask myself from time to time. This really does feel like a vital read, particularly in the current socio-political climate. Excellent review Jacqui. Simenon’s brilliant at conjuring atmosphere and character so efficiently – even in the Maigret books which are by necessity lighter, there’s a dark undertone, but in his non-Maigrets he really gets under the surface of things. It’s worrying that this is so relevant at the moment; why is it that we human beings are *still* threatened by anyone or anything we perceive as different to ourselves??? This sounds excellent, though I fear my (long term) plan will probably be to read the Maigret books then his other novels. It’s sad to note that as the UK and much of Europe travels back in time books like this will become ever more relevant. As for the current political situation, it’s a sad state of affairs indeed. Irrespective of whatever happens with Brexit (and I sincerely hope we remain in the EU), I fear we are going to be living with the consequences of this most divisive of issues for many years. It’s hard to see how we can heal some of the divisions amongst families, communities, political parties etc., all of which affect the UK as a whole. Can you believe he wrote around 450 books, but the quality is very even. I guess this is one of his ‘romains durs’? I know! An incredibly prolific writer, for sure – and, as you say, the quality of his work seems to be pretty consistent. Yes, this is firmly in ‘roman durs’ territory, although there’s probably less explicit/graphic violence here than in some of his others. I didn’t particularly like one of his most critically respected psychological novels, Dirty Snow, as the brutality of the violence was just too much for me. While The Krull House is undeniably powerful and shocking, it feels more approachable and prescient than some of the other romans durs – partly because the issues it explores remain so relevant. Oh, no! Well, others (including Guy and Annabel) really rate Dirty Snow, so maybe it’s just me? You’ll have to let me know what you think! I ‘ve said it before and so I will say it again, I have never read Georges Simenon but I always love the sound of his books. This one appeals more than most. One day I will. Great review. I think you’d really enjoy the Maigret mysteries, not only for the characterisation but the strong sense of place. The Krull House is a darker novel than the Maigrets, but its relevance to the issues of today makes it worth considering. 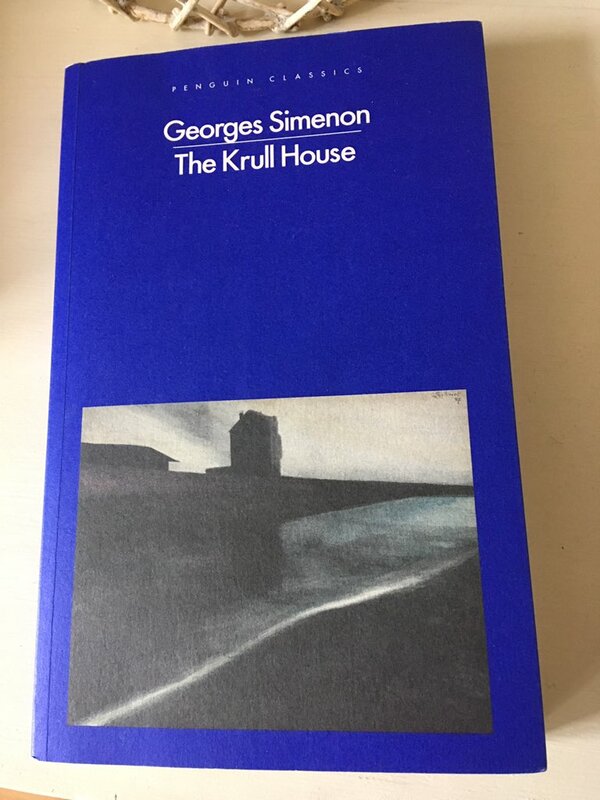 I haven’t read Georges Simenon but this review makes me think I would admire his work greatly. It definitely sounds like a timely read, sadly reflective of the world we live in today. As for Janet Mcneil–i have the ultra rare first novel CHILD IN THE HOUSE and TALK TO ME which is my favourite after TEA AT 4PM.Turnpike books are reprinting TEA and some short stories later this year. It sounds as if you lucked out there, Tina. Such wonderful finds. It’s great to hear than Tea at Four O’Clock is going to be reissued later this year as it so deserves to reach a wider readership. Cant beat TEA AT FOUR OCLOCK.Have read it three times. Not a title I’m familiar with but it sounds great. He doesn’t need a lot of space to develop a powerful story. It’s a very powerful little book, definitely one of the most striking Simenons I’ve read so far. The economy of style is very impressive.